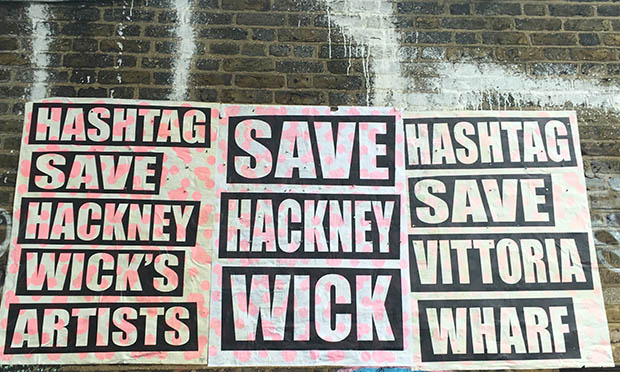 If those people who made Hackney Wick an artists’ mecca are no longer there, then what is the point in campaigners trying to ‘save’ it? A new exhibition in Hackney Wick sounds the clarion for artists and creative folk to get out while they still can. Strolling through Hackney Wick, it is seemingly impossible to turn a corner without stumbling upon a #SaveHackneyWick poster. The area is currently undergoing a drive for regeneration, with many plots earmarked for development and residents rallying against the local planning authority. 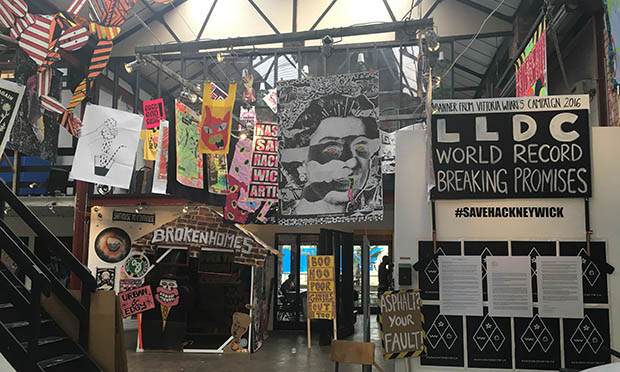 Wilde’s posters spawned artistic collaborations with local campaign groups and led to the transformation of the abandoned Lord Napier pub into a ‘protest building’ during the recent Hackney WickED open studios weekend. The likes of Sweet Toof, Mighty Mo, Mobster and Teddy Baden – all international street art superstars who started out in Hackney Wick – were among many of the artists involved. The ‘Save Yourselves’ exhibition at Stour Space this month, is a continuation of the art showcased on the pub building, with further artists from the area added into the mix. Wilde sees Hackney Wick as having been built by “the misfits, the rogues, the underdogs” who she claims are being pushed out in the drive for regeneration. “If the people that made this area are gone, what are we saving?” she says, seeing little value in saving a “beige rave”. The exhibition is billed as Hackney Wick’s ‘swansong’ – Wilde doubts the artists involved will ever exhibit together again. With over 50 artists included, the exhibition posed further challenges. Wilde did not want the exhibition to centre around street art, as it’s about Hackney Wick. She sees the exhibition as a collaborative installation and wants it to be read as “our story”. The sense of community is strong throughout the space, a crowdsourced wall of memories adding a bitter sweet touch. Many of the locations no longer exist, having been sold or torn down to make way for flats. The air of nostalgia is palpable and for Wilde this exhibition is all about legacy – it’s not for now. 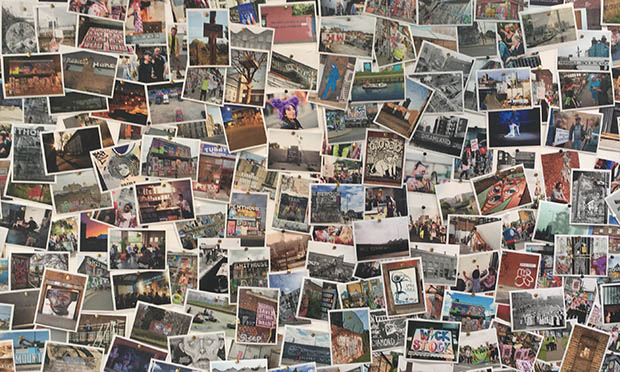 Whilst despairing of the present, the exhibition does include contributions from the Save Hackney Wick campaign, which is fighting for residents themselves to shape the future of the area rather than developers and planning authorities. Wilde explains the juxtaposition as necessary as “we need to try and preserve that small of pocket that is left, it’s important to at least try.” The campaign is currently trying to drum up support in its petitioning of the London Legacy Development Corporation and Tower Hamlets Council. The exhibition is at Stour Space, 7 Roach Road, E3 2PA until 31 October.